In December of 2016 the Community College Equity Assessment Lab (CCEAL) released findings that approximately 1/3 of California community college students are attending classes while experiencing the threat of homelessness and housing instability and 12% are hungry and concerned about whether and when they will have their next meal. Highlighting the numbers of community colleges students struggling with poverty, the report reinforces the findings of others that these institutions “are more likely than 4-year colleges and universities to serve students, who are working, have dependents, attend college part-time, and who are low-income”. (Nevarez & Wood, 2010). The report uses the following definitions of housing insecurity: “Housing insecurity also exists along a spectrum where homelessness—lacking a fixed, regular, and adequate nighttime residence—represents the extreme case. Unaffordable housing, poor housing quality, crowding, and frequent moves are other dimensions of housing insecurity” (p. 3) Resorting to auto residence, couch surfing and night-job napping are indeed evidence of homelessness and this report acknowledges the impact on student stress level. Food insecurity is all too prevalent and interferes with a student’s ability to concentrate and learn. Defined as “the limited or uncertain availability of nutritionally adequate and safe foods, or the ability to acquire such foods in socially acceptable ways,” food insecurity may be on the rise given the higher cost of education and the growing number of students with the aforementioned characteristics. (Dubick, Mathews, and Cady (2016). CCEAL suggests that this notion can be extended to students with housing insecurities as well. Colleges have begun responding to these concerns by creating food pantries, free and reduced lunch programs, and partnering with community organizations to create affordable housing options. 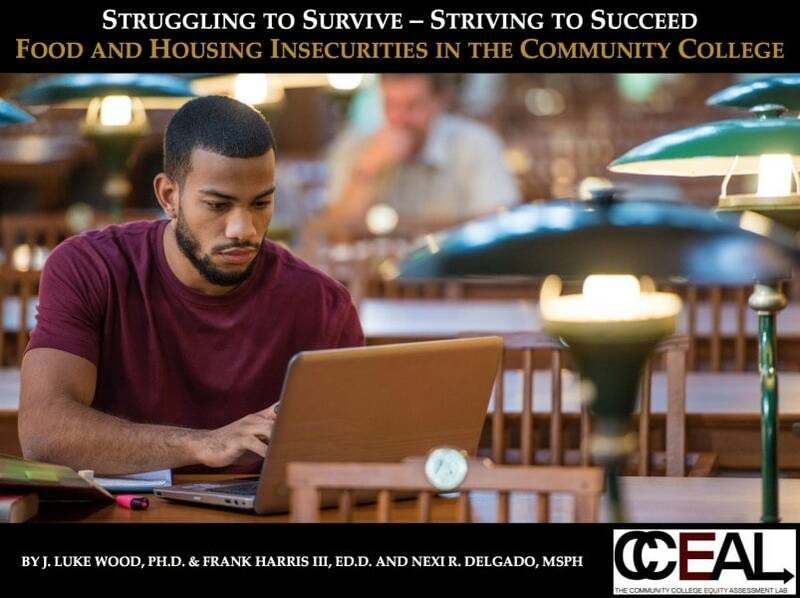 The good news is that CCEAL found that students with food or housing insecurities are generally more engaged with their faculty inside and outside of class than those without insecurities. This means they are more open to accepting assistance from trusted college mentors. OCLA’s next challenge is to partner with local campuses to make all students and faculty aware of WIN. Community college students need to know about the array of supportive services available to them including SNAP, emergency shelters, food banks, free health clinics and more.